We would like to congratulate Katie Hannemann on being names Centre of the year and Import Player of the year in the Eurobasket.com Premier league awards for 2015. We would also like to congratulate Amy Water on joining Katie on the Eurobasket.com Premier league First team and Edel Thornton on making the Eurobasket.com Premier League Second team for 2015. The full list of award winnwers can be seen at www.eurobasket.com/Ireland. Womens Premier League Playoff Final. Unfortunatley we were not able to finish the Women's Premier League campaign with a win in the Playoff final having lsot to Glanmire 77 -64. It was still a great season for the team and Coaches and we would like to thank each and everyone involved with the team. We would like to thank everyone who came and supported the team during the course of the season and especially all those that travelled to Galway to support the team in the Playoff final. Roll on Next Season. Congratulations to Coach Denise Hartnett and her team on winning the U12A Championship Final last Saturday in Neptune Stadium on a scoreline of 38-19 over Waterford Wildcats. 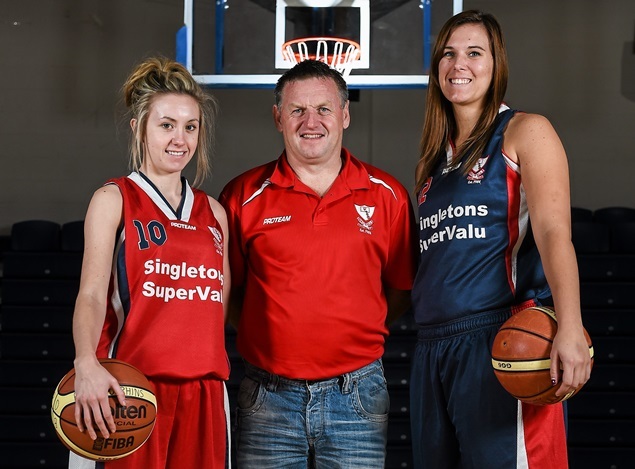 This is a big weekend for the Club with the Premier League team playing in the Basketball Ireland Women's Premier League final in Galway on Saturday at 8.00pm(Game will be available online please check the Basketball Ireland Website.) and the U12 A team playing in the Championship final in Neptune Stadium on Saturday at 3.10pm. If you cannont be in Galway please go along to Neptune Stadium on Saturday to support the U12's in their final. The results from the Clubs lotto draw on 25th March are now available on the website in the fundraising section. For those not able to get to Galway, Basketball Ireland are providing a live webcast of the Womens Premier League Final at 8.00pm on Saturday which will be available in Ireland and around the world for fans watching from abroad. The stream will be available for both desktop and mobile devices. For those not able to travel to the Womens Premier League Final on Saturday the club are hoping that you go along to Neptune Satdium to support the U12A team in their championship Final at 3.10pm. We are delighted to annouance that once again the club are organising supporters buses to another Final, the Women's Premier League final which is taking place on this Saturday at 8pm in Galway. We are hoping that as many supporters can make it as possibleas this is the first time that the club has made the Women's Premier League Final. Bus cost is €20 per seat, the hotel is the Lady Gregory Hotel in Gort, cost €100 triple, €80 twin or double and €70 single. Children must be accompanied by an Adult. First come first served basis.We will be confirming the bus on Wednesday so anyone looking to travel needs to confirm ASAP.